CJ Lyon & Sons, a tanker drainage services and septic tank emptying firm, was established in 1982. 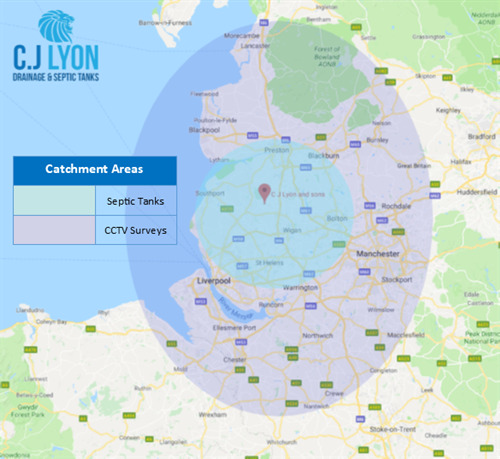 We have built a strong reputation with commercial and domestic customers around the North West of England, providing services such as; drain clearing, drain tracing, CCTV drain surveying, gully emptying, interceptor emptying, manhole surveying, and septic tank emptying. We use our knowledge of septic tanks and blocked drains to provide a quality service. Whether it’s a septic tank emptying, a drain unblocking or a drainage inspection for your commercial or domestic premises - we are here to help! We don’t cut corners and you can count on us to provide the same quality of work we have been providing to households and businesses since 1982. We aim to provide good value for money and with our qualifications and certifications you can have the knowledge that your work will be done to a high standard. Quality Domestic and commercial work – We pride ourselves on quality work, no blockage job is too large or small. Top quality equipment - We have a large range of vehicles from jetters to tankers. We also have different CCTV systems so we can survey drains from 40mm - 1200mm. We welcome enquiries on any of our drainage and septic tank services, you can contact us on Freephone 03333 202189 or 01257 462 986 for a quick and free quote.